Slice the white bulb part of scallions into thin slices. Cut the green part of scallions into 1/2 inch pieces and keep separate. Heat oil in dutch oven over coals to about 375 degrees for Frying. Add onion and scallion bulb rounds to dutch oven. Cut sausage into 1/4 inch thick slices. Stir in salt, black pepper, cayenne pepper, sausage, black-eyed peas, rice, broth, and water. Reduce heat to about 225 degrees for Simmering, and cover with the dutch oven lid. Cook about 40 minutes, until rice is tender and most liquid is absorbed. Remove dutch oven from heat and stir in the scallion tops. 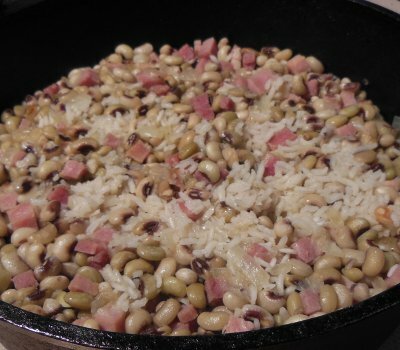 Let me know how you enjoyed your Hoppin' John!